Vos, a tall, distinguished looking gentleman with a strong South African accent, purchased his first coach in 1985: a 1938 Class 19D locomotive from Lowenthal’s Scrap Metal in Johannesburg renamed BIANCA after his daughter. His intention was to restore the carriages and hitch them to a South African Railways train as a family caravan, but the tariff for hauling the train was extortionate unless he sold tickets and so, quite naturally, the Pride of Africa was born. It’s time to board. Our wonderful, young hostess Lizzy gives us the grand tour of our lavish suite and asks us how we’d like our mini-fridge to be stocked. All complimentary, of course. 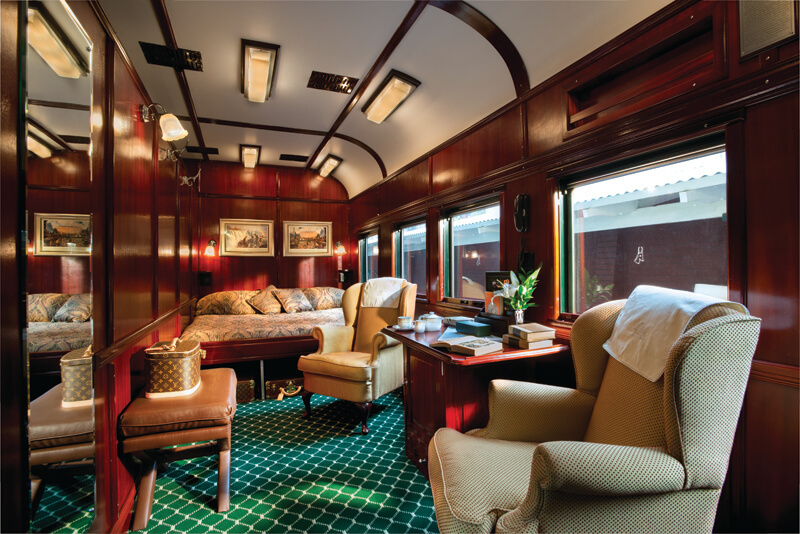 Then its to the observation car for high tea: champagne, cake, sandwiches and biltong as the train rolls through the goldfields of the Witwatersrand. At 7.30pm the gong rings for a five course dinner in the old-fashioned dining cart. Most of this journey is spent heavily sated with food and alcohol. I’m not quite sure how one would survive the 15 day ramble through South Africa, Botswana, Zimbabwe, Zambia and Tanzania. The excess is all part of the nostalgia, harkening back to a time without weight watchers and juices cleanse, when wealth was illustrated by the plumpness of your breasts. When you’re travelling past townships and bare-footed children running along the train tracks though, it does all seem a bit (forgive the pun) tasteless especially when you’re sitting back unbuckling your trousers too stuffed to finish the last few bites of lobster tail. However, tourism like this is crucial to supporting the South African economy; Rovos alone provides many job opportunities and tries where possible to use locally sourced produce. You’re by no means changing the world, but at least when your champagne is being topped up, you can rest in the knowledge that you are making some kind of contribution. During the night the train rattles through eerily barren landscapes crossing the border between the maize lands of western Transvaal and the Orange Free State, arriving into Kimberley shortly after breakfast. Once the wealthiest city in the world and still home to the De Beers headquarters, Kimberley is surprisingly unvisited by tourists and as such, has remained delightfully trapped in the distant past. We stand for a while in awe on the suspended viewing platform that juts out over the Big Hole, 580ft deep and a mile wide, filled with turquoise water before wandering round the diamond museum to marvel at some of the gems found embedded in the kimberlite. There’s something wonderfully cinematic and romantic about lying on your day bed watching the landscape change from the green marshlands of the diamond fields into the harsh, semi-desert of the Karoo. Through the night we bound across Beaufort West, the “Capital of the Karoo”, famous as the home of Christiaan Barnard, who performed the world’s first successful heart transplant. The night sky is startlingly clear scattered with thousands of burning white stars. On the hills, the tops of what look like wind mills dance with coloured LEDs. The train pulls up somewhere in the middle of nowhere shortly after day break for those who wish to walk the next 5 kilometres to Matjiesfontein,a tiny settlement founded by a Scottish railwayman, James Douglas Logan. The short stretch of tarmac with a colonial style hotel, an old fashioned post office and sun worn, pastel coloured petrol pumps leads into dust and desert. It’s a lonely kind of place, preserved just as it would have been when Logan planted his first handful of seeds. The museum is a labyrinth of underground caves piled high with ancient furniture, type writers, medical equipment, dolls and trinkets. It’s hard to imagine that this quiet place was where 10,000 soldiers were based during the Boer War. After miles more of desolation, the train enters the Hex River tunnels, emerging blinking into the lush fertility of the Hex River Valley. This is South Africa’s wine lands where white dutch country style houses stand orderly amongst the vines. The train heaves to a stop alongside golden fields of corn and cows grazing. We sip cocktails and wait. There’s a rumour that the train lines have been stolen, we’re going to be delayed here for some hours. How delightful! In fact, when we do get rolling again the sun is just setting. Through the pink and orange hue, and streaming smoke of a wild fire Table Mountain appears.